1. 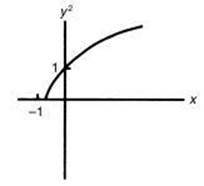 If , for what value(s) of x does the graph of f(x ) have a vertical asymptote? 2. What is the distance between the points with coordinates (−3,4,1) and (2,7,−4)? 11. The third term of an arithmetic sequence is 15, and the seventh term is 23. What is the first term? 12. A particular sphere has the property that its surface area has the same numerical value as its volume. What is the length of the radius of this sphere? 14. The pendulum on a clock swings through an angle of 1 radian, and the tip sweeps out an arc of 12 inches. How long is the pendulum? 16. If x + y = 90°, which of the following must be true? 19. The graph of y = x4 + 11x3 + 9x2 – 97x + c is shown above with the window shown below it. Which of the following values could be c ? 20. Which of the following is the solution set for x (x – 3)(x + 2) > 0? 21. Which of the following is the equation of the circle that has its center at the origin and is tangent to the line with equation 3x – 4y = 10? 23. If f(x) = x3 and g(x) = x2 + 1, which of the following is an odd function (are odd functions)? 24. In how many ways can a committee of four be selected from nine men so as to always include a particular man? 25. 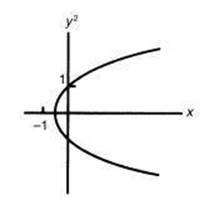 The figure above shows a portion of the graph of y = 2x. What is the sum of the areas of the three inscribed rectangles shown? 26. If the mean of the set of data 1, 2, 3, 1, 2, 5, x is what is the value of x ? 28. Matrix X has r rows and c columns, and matrix Y has c rows and d columns, where r, c, and d are different. Which of the following statements must be false? II. The product of XY exists and has r rows and d columns. III. The product XY exists and has c rows and c columns. (A) He passed the course; therefore, he studied. (B) He did not study; therefore, he will not pass the course. (C) He did not pass the course; therefore he did not study. (D) He will pass the course only if he studies. 30. If f(x) = x – 7 and g(x) = , what is the domain of g o f? 32. The solution set of 3x + 4y < 0 lies in which quadrants? *Logic questions such as this have appeared on past SAT Math Level 2 exams. 33. 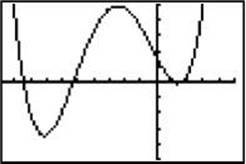 Which of the following could represent the inverse of the function graphed above? 34. If f is a linear function and f(–2) = 11, f(5) = –2, and f(x) = 4.3, what is the value of x? 35. A taxicab company wanted to determine the fuel cost of its fleet. A sample of 30 vehicles was selected, and the fuel cost for the last month was tabulated for each vehicle. Later it was discovered that the highest amount was mistakenly recorded with an extra zero, so it was 10 times the actual amount. When the correction was made, this was still the highest amount. Which of the following must have remained the same after the correction was made? 37. The formula A = Pe0.04t gives the amount A that a savings account will be worth if an initial investment P is compounded continuously at an annual rate of 4 percent for t years. Under these conditions, how many years will it take an initial investment of $10,000 to be worth approximately $25,000? 38. A coin is tossed three times. Given that at least one head appears, what is the probability that exactly two heads will appear? 42. A committee of 5 people is to be selected from 6 men and 9 women. If the selection is made randomly, what is the probability that the committee consists of 3 men and 2 women? 45. 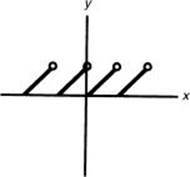 If f(x) = ax2 + bx + c , how must a and b be related so that the graph of f(x – 3) will be symmetric about the y-axis? 47. What is the value of x if and sin x = 5 cos x ? 50. 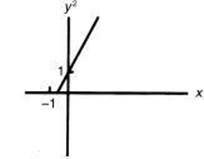 If (x,y) represents a point on the graph of y = 2x + 1, which of the following could be a portion of the graph of the set of points (x,y2)? 1. 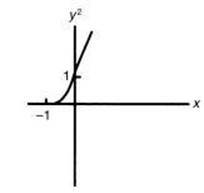 * (E) Graph the function f in the standard window and observe the vertical asymptote at x = –2. 10. 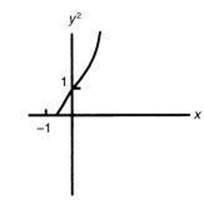 * (D) Plot the graph of y = sin 2x in degree mode in an window and observe that the graph crosses the axis 3 times. 16. (C) Cofunctions of complementary angles are equal. Since x and y are complementary, tan and cot are cofunctions. 17. (B) Plot the graph of y = x3 + 5x + 1 in the standard window and zoom in a couple of times to see that it crosses the x-axis only once. To make sure you are not missing anything, you should also plot the equation in a x [–1,1], y [–1,1] and an x [–100,100], y [–100,100] window. 20. * (E) Plot the graph of y = x(x – 3)(x + 2) in the standard window, and observe that the graph is above the x-axis when –2 < x < 0 or when x > 3. CAUTION: For calculus students only: This difference quotient looks like the definition of the derivative. However, no limit is taken, so don’t jump at f '(x), which is Choice D.
23. * (A) Enter x3 into Y1 and x2 + 1 into Y2. Then enter Y1Y2 into Y3; Y1(Y2) into Y4; and Y2(Y1) into Y5. De-select Y1 and Y2. Inspection of Y3, Y4, and Y5 shows that only Y3 is symmetric about the origin. 26. * (E) Mean Therefore, x = 8.9. [4.1]. 27. * (E) Law of sines: . 32. * (D) Use the standard window to graph , by moving the cursor all the way left (past Y =) and keying Enter until a “lower triangle” is observed. The shaded portion of the graph will lie in all but Quadrant I. 34. * (C) Since these points are on a line, all slopes must be equal. 36. 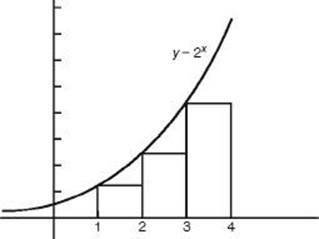 * (B) Plot the graph of y = x–2/3 in the standard window and observe that the entire graph lies above the x-axis. 38. (B) There are 8 elements in the sample space of a coin being flipped 3 times. Of these elements, 7 contain at least 1 head and 3 (HHT, HTH, THH) contain 2 heads. 46. * (A) Use the change of base formula and graph as Y1. Graph y = ln(0.5x) as Y2. The answer choices suggest a window of x [0,10] and y [0,2]. Use the CALC/intersect to find the correct answer choice A. 48. 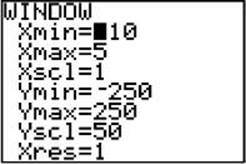 * (B) With your calculator in polar mode, graph in a and window. Let run from 0 to 2 in increments of 0.1. The graph of the function and the two axes form an isosceles right triangle of side length 1, so its area is 0.5. 50. * (C) Plot y = (2x + 1)2 in a window with x [–2,2] and t [–1,5], and observe that choice C is the only possible choice.